Hornbeams ( Persian: خلنج، خلنگ، خدنگ، ممرز, Arabic: شرد)are hardwood trees in the flowering plant genus Carpinus in the birch family Betulaceae. The 30–40 species occur across much of the temperate regions of the northern hemisphere. 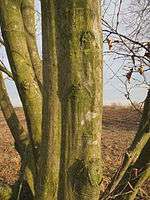 The common English name "hornbeam" derives from the hardness of the woods (likened to horn) and the Old English "beam", a tree (cognate with German "Baum"). The American hornbeam is also occasionally known as blue-beech, ironwood, or musclewood, the first from the resemblance of the bark to that of the American beech Fagus grandifolia, the other two from the hardness of the wood and the muscular appearance of the trunk, respectively. The botanic name for the genus, Carpinus, is the original Latin name for the European species. Though some botanists grouped them with the hazels (Corylus) and hop-hornbeams (Ostrya) in a segregated family, Corylaceae, modern botanists place the hornbeams in the birch subfamily Coryloideae. Hornbeams are small to medium-sized trees, Carpinus betulus reaching a height of 32 m.:296 The leaves are deciduous, alternate, and simple with a serrated margin, and typically vary from 3–10 cm in length. The flowers are wind-pollinated pendulous catkins, produced in spring. The male and female flowers are on separate catkins, but on the same tree (monoecious). The fruit is a small nut about 3–6 mm long, held in a leafy bract; the bract may be either trilobed or simple oval, and is slightly asymmetrical. The asymmetry of the seedwing makes it spin as it falls, improving wind dispersal. The shape of the wing is important in the identification of different hornbeam species. Typically, 10–30 seeds are on each seed catkin. The 30–40 species occur across much of the temperate regions of the northern hemisphere, with the greatest number of species in east Asia, particularly China. Only two species occur in Europe, only one in eastern North America, and one in Mesoamerica. Carpinus betulus can be found in Europe, Turkey and Ukraine. Hornbeams are used as food plants by the larvae of some Lepidoptera species, including autumnal moth, common emerald, feathered thorn, walnut sphinx, Svensson's copper underwing, and winter moth (recorded on European Hornbeam) as well as the Coleophora case-bearers C. currucipennella and C. ostryae. Hornbeams yield a very hard timber, giving rise to the name "ironwood". Dried heartwood billets are nearly white and are suitable for decorative use. For general carpentry, hornbeam is rarely used, partly due to the difficulty of working it. The wood is used to construct carving boards, tool handles, handplane soles, coach wheels, piano actions, shoe lasts, and other products where a very tough, hard wood is required. Perhaps most interestingly as gear pegs in simple machines, including traditional windmills. It is sometimes coppiced to provide hardwood poles. It is also used in parquet flooring and for making chess pieces. Carpinus betulus L. — European hornbeam - widespread across much of Europe; Turkey, Iran, Caucasus; naturalized in a few places in US. ↑ Flora of China, Vol. 4 Page 289, 鹅耳枥属 e er li shu, Carpinus Linnaeus, Sp. Pl. 2: 998. 1753. ↑ Flora of North America, Vol. 3, Hornbeam, Carpinus Linnaeus, Sp. Pl. 2: 998. 1753; Gen. Pl. ed. 5, 432, 1754. ↑ Miscellaneous Publication. U.S. Department of Agriculture. 1972. p. 297. ↑ "Carpinus fangiana". Rogers Trees and Shrubs. ↑ Dai, Jing; Sun, Bainian; Xie, Sanping; Lin, Zhicheng; Wu, Jingyu; Dao, Kequn (2013). "A new species of Carpinus (Betulaceae) from the Pliocene of Yunnan Province, China". Plant Systematics and Evolution. 299 (3): 643–658. doi:10.1007/s00606-012-0750-1. 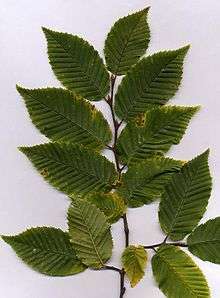 Wikimedia Commons has media related to Carpinus. Look up hornbeam in Wiktionary, the free dictionary. Wikisource has the text of the 1911 Encyclopædia Britannica article Hornbeam. Eichhorn, Markus (December 2011). "Hornbeam". Test Tube. Brady Haran for the University of Nottingham.